We were able to help Dan find the doll he needed, but we still have a mailing list of people looking for this doll in both blond and brunette versions. 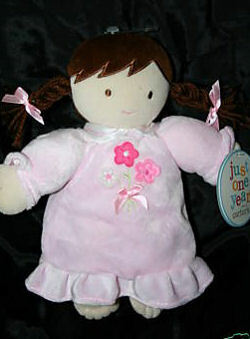 Hi, I’m looking for a Carter’s Just One Year brown hair doll with pink flower dress for a replacement for my daughter. This doll is our daughter’s favorite “baby.” She sleeps with it at her nap and every night. It is lost, and we can’t find it. If we found another one she would be so excited!! Jeez that was fast. Thank you everyone!! I purchased the one from Ebay today. Much appreciated!! Let us know if you are still searching.